Where Is My Sadhu Painting? Biljana D. Obradović’s first volume of poetry, Frozen Embraces (Belgrade, Center of Emigrants from Serbia, 1997), won the Rastko Petrović Award for the Best Book of 1998. Her second collection, Le Riche Monde, was published bilingually. (Belgrade, Raška Škola, 1999). Obradović’s poems are included in the anthologies Like Thunder: Poets Respond to Violence in America (University of Iowa, 2002), Key West: A Collection (White Fish Press, 2001), and Three Poets in New Orleans (Xavier Review Press, 2000). Her work appears in numerous journals, including Poetry East, The Bloomsbury Review, Prairie Schooner, and Književne Novine. 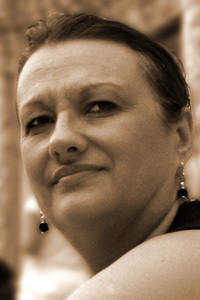 Obradović is an associate professor of English at Xavier University of Louisiana.